As a frequent concertgoer and prospective arts manager, I am intrigued by the question of how to create online audiences for symphony orchestras. What does it mean to create such an audience? And moreover, how does an online audience for an orchestra differ from the audience that comes to the concert hall? Or does it? As I begin to explore these questions, I look first at current efforts among classical music organizations. 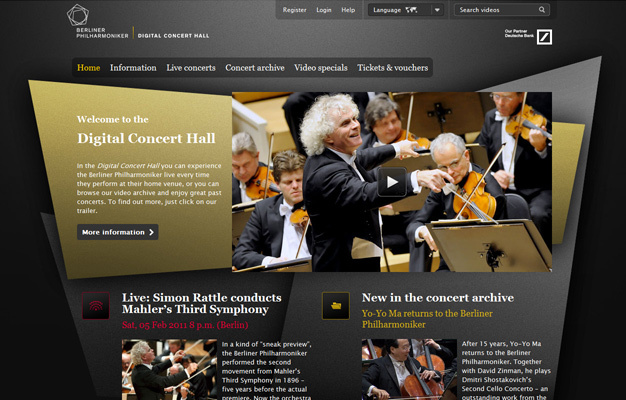 One example of a world-class symphony orchestra using technology to connect with an audience online is the Berlin Philharmonic and its Digital Concert Hall. Launched in December 2008 through a partnership with Deutsche Bank, the Digital Concert Hall is a virtual concert venue featuring performances by the Berlin Philharmonic. The platform enables orchestral music lovers to experience more than 30 live broadcasts each year. A few days after each concert occurs, the recordings are moved over to the Concert Archive, where they can be watched on-demand through either a weekly (€9.90), monthly (€24.90), or yearly (€149) subscription. The section “Video Specials” features backstage interviews with orchestra members and artistic director Sir Simon Rattle, as well as recordings of the orchestra’s education program and a selection of films about the Berlin Philharmonic, including the award-winning movie “Rhythm Is It.” By offering multiples perspectives on the inner-workings of the orchestra, the Digital Concert Hall enables the Berlin Philharmonic to connect with both its existing fans and a new audience. Besides the Berlin Philharmonic, there are many more examples of how orchestras are already making use of the digital technology to connect with audiences online. For instance, the London Philharmonic Orchestra launched the iPad app “The Orchestra” in 2012, which provides users with a similar behind-the-scenes look at the orchestral world. The New York Philharmonic employs an extensive digital media strategy to make concert recordings available via multiple channels such as YouTube, Spotify, iTunes, and Flickr, as well as through radio and television broadcasts and a mobile app. Multiple recent studies from different countries document the increasing importance of online audiences in the arts sector. In 2010, the National Endowment for the Arts analyzed how technology influences arts participation, while the Arts Council England conducted research to capture and quantify online engagement with arts and culture in England. In 2011, the Australia Council for the Arts carried out a study examining how Australian audiences are connecting with the arts online.